Not so hasty! We have to wait for the 2018Q4 QCEW data to come out in May! 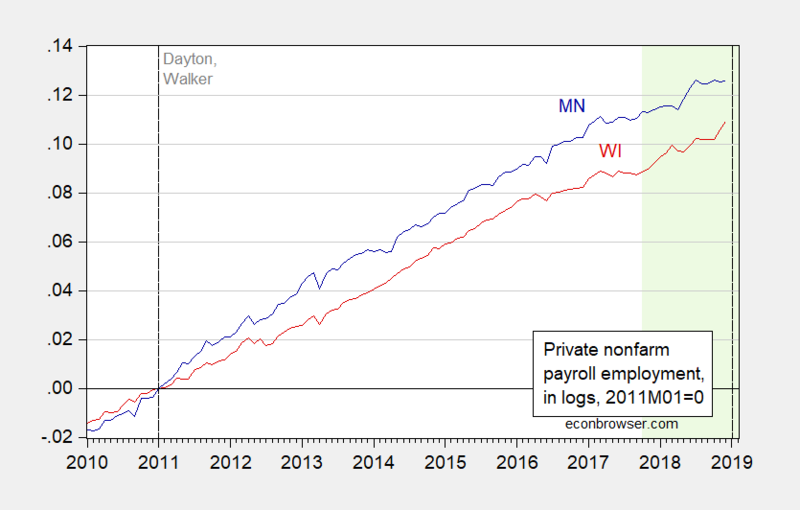 And you have a crystal ball that says these numbers will show employment has surged under Walker? Get back to us in May when they don’t. Yea – he might increase his sample size to TWO. Of course you are doing statistics with sample sizes of ONE. Much more accurate! Not only is Nancy Pelosi senile, she’s near completely worthless. Pelosi has two winning choices. 1) Not give donald trump a dime for the wall and trump caves on everything. 2) Not give donald trump a dime for the wall, and he commits political suicide by shutting down the government TWICE, and God knows for how long the 2nd time. Give donald trump $1.3 billion to $2 billion for a wall, watch trump TAKE the $2 Billion, then stall for a few weeks, then start the process all over again with trump having $2 Billion of US taxpayers dollars for a wall that will achieve and stop NOTHING. And then Democrat voters sitting at home, wondering “Why do we vote for Democrats, when they give Republicans whatever the F___ they want anyway?!?!?! ?” And wondering why go to the voting booth in 2020 when all senile Nancy can do is clap her hands together like a kindergartner and then fold like a cheap lawn chair when it’s time to negotiate. Which of the 3 choices will the senile and useless Nancy Pelosi take?? The same one she has taken that last 17 years leading the Democrats, the LOSING one. Put it up on “Predict It” and bank your life’s savings. Senile and worthless? Seriously? Why are so incredibly afraid of strong women? Please stop this garbage. Would you tell me what your definition of “strong” is?? The woman needs to head to the hospital right now, do a CAT scan on her brain and release the results to the public. Then we’ll know if she has a legit excuse for being a useless leader or is just a dumb F___. Why don’t you see if they have a blow-up doll replica of Pelosi on Amazon, buy it and get busy with it, instead of fawning over her here. PLEASE! The government remains open for the rest of the fiscal year and still not a penny for Trump’s wall. This is why Sean Hannity hates this deal. And anything Hannity hates is a win for Pelosi. Had a man negotiated this – you would applaud. But since it was a woman that handed Trump his hat – you just cannot stand it. Which makes you as bad as Trump in this regard. Wow, Mose, you are really seriously totally off the deep end on this. You seem to have completely lost your mind on this one, if you ever had one. You are the only person in the known universe making the argument you are making, the only one. Absolutely everybody else on all political sides of this recognize that Nancy Pelosi has totally defeated Trump. He has been forced to accept even less money than he was offered previously when he shut the government down. But now he will not, can not. He may try to scam some more funds illegally from other money pots, but he will get his hand slapped. Go ahead, Mose, name a single person, right wing, left wing, whatever wing, who is currently spouting this lunatic drivwl that Pelosi is “senile and completely worthless.” There are Republicans saying bad things about her, but they are complaining that she is so effective at thwarting Trump and them, not that she is senile and “completely worthless.” I also note that her popularity, has been steadily rising since she became Speaker. Trump and his allies have been unable to lay a hand on her without her making complete fools out of them. Get real, Mose, this really is seriously insane. I actually have come to appreciate Nancy Pelosi a whole lot more lately. If Trump stamps his feet and has another tantrum because he didn’t get the full amount, nobody can say Pelosi and the Democrats failed to make an attempt to compromise. The GOP and Trump keep shifting what they want and making it more and more onerous. The detention bed routine is just one more case of this. The GOP and Trump seem hell-bent on shutting it down again. Pelosi will make some missteps, for sure, but she is far savvier and far tougher than Trump will ever be. We are seeing that in action. She’s currently setting them up to take the fall. Again. They are also helping out by setting themselves up, but it helps when you have somebody like Pelosi who knows the ropes making sure the rope goes into GOP hands to hang themselves with. I agree. Now go tell Moses to cease his parade of attacking women in general. More beds show ICE can lock up more brown people. After all – the extreme inhumanity of ICE is not inhumane enough for Ann Coulter. And we know Trump bows down to her every wish. In other words, component production stays in Mexico with the role of Wisconsin being mere assembly at really low wages and often filled by people who have moved from China. Walker and Trump were quite dishonest in their portrayal of this deal being high value production at high wages for lots of Americans. Somebody’s looking for work as The Dotards new running-dog.